Modern industrial city with 32 500 inhabitants 25 km northwest of Miskolc, in the central part of Borsod-Abaúj-Zemplén county, in the valley of the Sajó. The names of the outskirts villages of Kazincbarcika (Sajókazinc, Barcika, Berente), which was given the rank of town in 1954, were mentioned in records already in the 13th century as estates belonging to the fortress of Dédes in the vicinity. Coal-mining was commenced in the second half of the 19th century and remained a dominant line of the town till the 1980s. 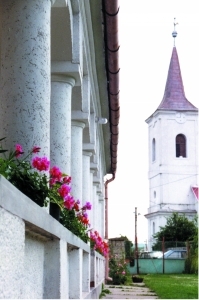 A significant monument building of the town is the Baroque Calvinist church built in the 18th century. Béni Egressy, composer of 'Szózat' (great poem of the Hungarians) was born in Sajókazinc in 1814 as the son of the local Calvinist pastor. 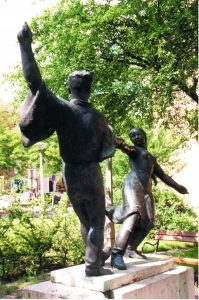 The town is also mentioned as the city of statues for there are 40 statues placed in the public areas and parks of more than one-million square metres of the city. Exhibitions of fine arts are held in the City Gallery, the Small Gallery and the Children's Gallery of the town, presenting works by contemporary artists first of all. Hill-tops, woods and fortresses of Upponyi and Bükk mountains provide various facilities of wandering in nature and resting. The cultural programmes of the town are organized mainly in the Béni Egressy Community Centre and Library. A significant cultural event is the series of programmes called the Summer of Kazincbarcika offering entertainment of high standard to the inhabitants of the region. Its internationally famous events include the Jr. István Horváth National and International Drama Festival, the International Folklore Festival of the Valley of the river Sajó, the Arts Festival of Borsod, the World Music Festival, the International Festival of Brass and Reed Bands. The town has lively, colourful sports life. It is well-equipped with sports facilities shown by the fact that it has 28 sports associations. The Sports Centre provides facilities first of all for the sports sections of the two largest clubs, the Sports Association and the Sports Club of Kazincbarcika. The opening of the ice rink led to the development of local ice hockey, the indoor swimming pool provides facilities for local swimming. The bath of the town and the boating lake have been awaiting the lovers of water sports for decades. In the bath and in the skittle ground you can also find tennis courts and gyms. Owing to its high standard sports life, Kazincbarcika was awarded the title of the National Sports Town in 1998. The sister towns of Kazincbarcika, such as Knurów and Swidnica in Poland, the Bavarian Burgkirchen, Técső in Sub-Carpathia, Nagyrőce in Slovakia and Nagyszentmiklós in Romania play an important role in establishing international connections. 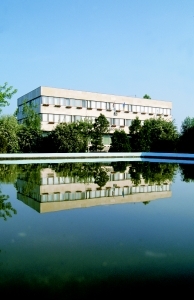 The town also has good connections with Rozsnyó and Rimaszombat in Slovakia and Dimitrovgrád in Bulgaria. 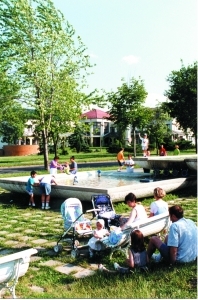 The town was awarded the European Diploma in May 1999 and the European Flag of Honour in August 2002 by the European Parliament for maintaining successful international connections.